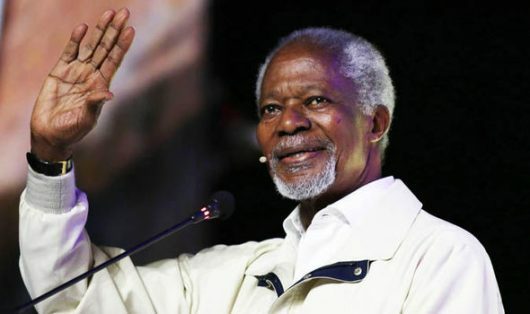 general at the United Nations, Ibrahim Gambari, have mourned the passing on of Mr. Kofi Annan, a former Secretary General of the United Nations. Jonathan has described the former UN scribe as a renowned icon of peace and a great son of Africa. In a tribute to Mr Annan who died Saturday at the age of 80, Mr. Jonathan noted that his extensive reforms reinvigorated the UN systems and positively impacted international relations. “I am deeply saddened by the death of Kofi Annan, a world renowned icon of peace and diplomacy. He was a distinguished and accomplished international public servant and one of Africa’s most prominent diplomats,” Mr Jonathan said in a statement by his spokesperson, Ikechukwu Eze. “As the United Nations Secretary-General, Annan introduced far-reaching reforms that reinvigorated the UN systems and positively impacted international relations. “A consummate diplomat, Annan successfully managed the contending powers in the UN and stood firmly for development, human rights and a peaceful world; a commitment that earned him the Nobel Peace Prize. In a press statement by his media office in Abuja, the former Vice President Atiku Abubakar described Mr. Annan as a quintessential promoter of global peace; a great African, an astounding diplomat and one of the leading lights in the African continent of this century. Atiku lamented that a leading light has passed out of Africa and called on Africans of the present generation to emulate the late Anan’s commitment to the well- being and development of the African continent while serving as Chief Scribe of the United Nation’s Organisation. The PDP presidential aspirant recalled that during his days at the United Nations, the great African diplomat and Ghanaian citizen, served the international community with distinction and for this reason, his period of service as UN Secretary General was to a large extent peaceful internationally because of his wisdom, patience, persistence and integrity. “For this reason, Kofi Annan was bestowed with the Noble Prize for Peace, in 2001 by the Alfred Noble Foundation, an award he shared with the UN, which he led,” Atiku recalls. Atiku stated further that the late Kofi Annan was much respected and trusted by members of the UN who took his position and counsel on issues seriously. The Waziri Adamawa said further that even after retirement from the services of the UN, Kofi Annan, never indeed retired from playing critical international roles that advanced the well- being of Africa and the world. According to Atiku, the late UN Chief Scribe set up the Kofi Annan Foundation which he employed as a platform to keep alive, public discourse on issues that affect Africa and the World as well as lend a hand to promote better global governance and strengthen the capacities of people and countries to achieve a fairer and more peaceful world. Atiku therefore conveyed his deepest condolences to the Annan family, the Kofi Annan Foundation, the international community, the government and people of Ghana and all Africans on the passing on of this global statesman. In his reaction, Ibrahim Gambari, expressed sadness on the death Mr Annan whom he described as a friend, brother and former boss.